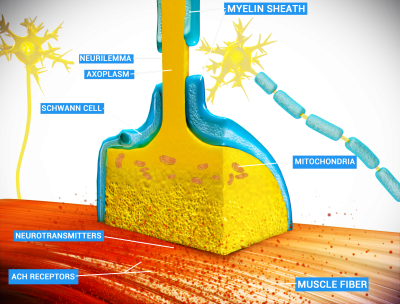 The neuromuscular junction is a connection between a skeletal muscle and a nerve called synapse. It is for the communication between the muscles and the nerves, where the nerves get information, transfers to the brain and sends impulses to the muscles which then react to these stimuli. The result is the contraction of the muscle. It is one of the most analyzed synapses which can be shown on simple examples, so even the pupils are learning trough some exams during classes. Let’s have a closer look at its parts. The neuromuscular junction is the space between the motor neuron axon and a motor end plate. This kind of a gap is responsible for the connection between the motor neuron and the muscle. It is called synapse or in this case, myoneural since it is between the muscles (myo-), and the nerves (-neural). The impulse travels between the gap and stimulates the muscle contraction. These kind of connections are everywhere in our body, and it is autonomous or in order words, independent of our will. The main two parts of the neuromuscular junction are the skeletal muscle cell or a myocyte and a motor neuron or the nerve cell which is responsible for skeletal muscle innervation. These are special kind of nerves which are specialized in muscle innervation and they originate from the spinal cord. The end of the nerve is called axon and it ends in the junction or the synapse where it goes to the motor end plate. The presynaptic membrane which is where the neurotransmitter substance is being released. The gap between the membranes which is called synaptic cleft and it contains the substances that transmit the impulses to the muscles. They are in a form of microparticles created in a high concentration. These are neurotransmitters. The last part of this system is called postsynaptic It has the receptors for the neurotransmitters which are basically chemical substances that transmit the reaction to the next part of the system which is the motor end plate. It is then continued with a chemical process which leads to contraction. So, the main path this system goes is from the motor neuron into the synaptic cleft and eventually at the skeletal muscle cell. The whole process starts when the Calcium gets released from the cells at the motor neuron. The high concentration of the Calcium starts the pumps that release the neurotransmitters through the process called exocytosis. Then, the neurotransmitter exits the motor neuron and goes into the synaptic cleft where it makes its way to the postsynaptic membrane. The neurotransmitter which takes action in the muscle system is called acetylcholine and it’s being secreted by somatic motor neurons at the end of the axon. The acetylcholine goes into the synaptic cleft and passes the path to the postsynaptic membrane or the motor end plate which contains lots of receptors that use a lock-and-key mechanism. The acetylcholine perfectly suits the shape of the receptors, activates it and leads to a new process. Then the sodium pump gets activated where the ions go to the muscle cell. At the same time, the potassium ions diffuse from the muscle cells. Since the sodium level is higher than the potassium level, the membrane of the muscle gets depolarized since it has more positive ions. This causes the muscle contraction and it is called action potential. Right after the contraction, the Calcium gets back to its levels, the sodium drops, and the potassium rises. This repolarizes the membrane which gets back to being negative again. This process gets repeated constantly. The acetylcholine is being catalyzed into an acetate and choline by acetylcholinesterase which is the enzyme that breaks down the neurotransmitter and it is responsible for level changes of this substance. The products of the acetylcholine breakage go back to synaptic cleft where they are reused again and this process is called active reuptake. There are numerous diseases that affect neuromuscular junction and can affect the neurotransmitters, the receptors, the membrane, and all of the other aspects of this connection. It can be caused by toxins, gasses, antibiotics, chemicals, organophosphates which are insecticides, etc. Some of the disorders can be due to genetics as well. Some of the conditions are Myasthenia Gravis, ALS or amyotrophic lateral sclerosis, multiple sclerosis, spinal muscular atrophy, etc. There are some disorders which can be caused by overuse of neuromuscular junction. This kind of syndrome is followed by overstimulation of the muscles by numerous impulses received from the nerves. The muscles get their maximum strength and they end up in overstimulation and stiffness. In other times, muscles tend to get stiff even during normal activities. This type of condition is caused by antibodies which affect the neurons. The secretion of acetylcholine gets interrupted which ends up in continuous stimulation of the nerve cells which also ends up in muscle stiffness.